We stress the importance of good content in our training and workshops, it is the cornerstone of a successful life science or biotechnology social media strategy. Content can be fully original, such as a blog post written by one of your company’s scientists about their research, or you can share links, news, presentations from others on third party applications such as Twitter or LinkedIn, as long as you credit them properly. Both original and shared content benefit from reviewing updates from the web or social networks regularly, and a good way to do this is through RSS (Really Simple Syndication) feeds. RSS feeds do the work for you, telling you when content all over the web is updated, and we can create a customized feed for you based on your needs. See this example of a drug discovery blogs feed we created, or the San Diego Biotech News feed. The information can also be sent as email. 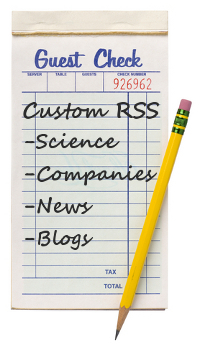 Just fill out the Custom Life Science RSS form and we’ll do the rest! We think you’ll also find that a custom feed will help you stay on top of your industry, whether you’re in R&D or Marketing. As always, contact us if you have any questions.